Airflow system: 70% air re-circulation, 30% air exhaust. 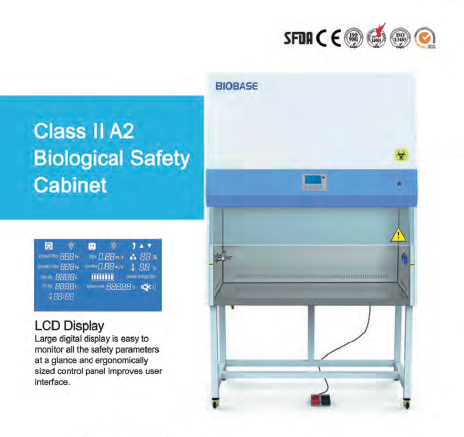 Suitable for working with microbiological research in the absence of volatile or toxic chemicals and radionuclide. -Two layers laminated toughened glass >5mm, anti UV. -HEPA filter life and UV life indicator. -70% air re-circulation, 30% air exhaust. -Automatic air speed adjustable with filter block. -Most accessories are standard. No need to pay more, save your money. -Work area surrounded by negative pressure, it can ensure maximum safety in work area. -Visual&Audio alarm when filter replacement, window over height, abnormal air flow velocity. -Remote control making the operation much easier. -Foot switch for adjust front window height. -Universal caster with brake and leveling feet. -UV lamp, fluorescent lamp, waterproof socket are includes.